Lodging in Branson will always be convenient and comfortable if you stay at some of the beautiful accommodations of Thousand Hills Golf Resort. As one of the most popular vacation destinations in Branson, Thousand Hills is sure to help you make your vacation a wonderful one. Beautifully located near the famous 76 Country Music Boulevard in the heart of Branson, the resort is the perfect place for families who want to enjoy a fantastic vacation experience as it provides easy accessibility to exciting attractions, world-class live entertainment shows, museums, parks, and shopping and dining venues. The fantastic vacation experience that you can enjoy at Thousand Hills Golf Resort also gives you the opportunity to play on the most popular 18-hole golf course in Branson. Every year, thousands of golfers play in this award-winning Thousand Hills Golf Course. While enjoying a wonderful vacation at Thousand Hills Golf Resort, you don’t only have the chance to play golf but also let you enjoy the picturesque views of the beautiful natural scenery and spectacular wildlife around the Ozark mountains. Even if you still long your mom’s dishes while on vacation at Thousand Hills Golf Resort, you still can enjoy home cooked meals inside your room as every Thousand Hills accommodation features a fully equipped kitchen complete with modern appliances including fridge, microwave oven, washer/dryer, dishwasher, pots and pans, and kitchen wares and utensils. With all these great amenities, it’s just easy to prepare your own food as well as washing your laundry so you won’t go home with dirty clothes. Thousand Hills Golf Resort offers the best lodging in Branson as they have three lodging options to choose from. You can choose from golf or lake front condos, log cabins or multiple bedroom townhomes. These lodging choices can be very convenient and comfortable as they all feature top quality amenities such as wi-fi internet access, cable TV with HBO, and DVD player. When you opt to stay at either golf or lake front condos, you can always have easy accessibility to the clean and crystal clear waters of the pristine Table Rock Lake. If you like to enjoy great water fun activities on the lake, staying in a golf or lake front condos is the right thing to do. If you like to go boating or fishing, you can easily rent a boat at the nearby State Park Marina. If you prefer to stay in a secluded place with a relaxing atmosphere in a calm environment, choose the cozy log cabin. The beautiful setting of log cabin accommodations at Thousand Hills Golf Resort, allows you to enjoy spectacular scenery, beautiful landscape, and fascinating wildlife that surround the resort. For big families, staying in a townhouse is the ideal accommodation to choose as this comfy lodging option can accommodate up to 8 guests. 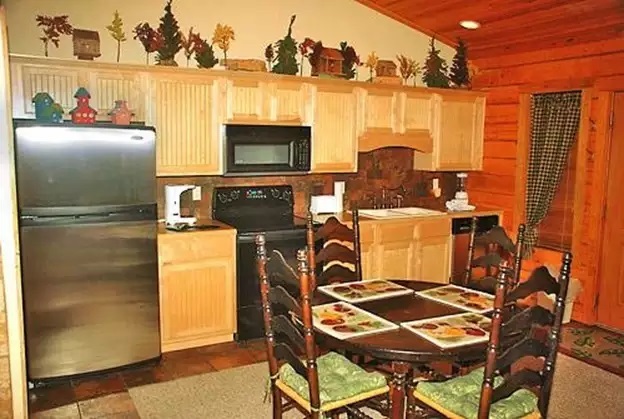 So, if you want to spend a wonderful vacation in Branson and still prefer to eat home-cooked meals, stay at the comfy accommodations of Thousand Hills Golf Resort as they feature fully equipped kitchen.